I am wondering what do guinea pigs eat. I adopted a guinea pig and bought some guinea pig pellets at the local pet shop. She can also eat grass. Will that be enough for her to eat? Guinea pig pellets will not be sufficient to feed your pet. You will need more different kinds of food. Guinea pigs need to eat a lot of fresh fruit and vegetables, like apples, oranges, kiwi, tomato, cucumber, peppers, carrots, broccoli, spinach, etc. Also, they always need some timothy hay available. If you add some herbs like mint, dandelion, basil and parsley than you are really doing a favor to their health. You will also need to supplement their diet with vitamin C. And don't forget fresh water. By the way, when you are buying guinea pig pellets, watch out for those with seeds. Guinea pig should not eat seeds. 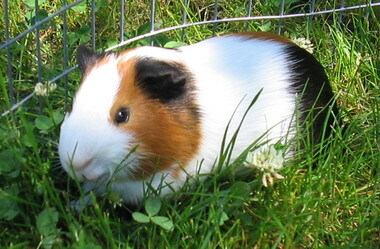 You can check our guinea pig diet page for more detailed info. Excel pellets are the best you can give your Guinea Pig (editor note: only available in the UK, in the U.S. consider Osbow Cavy Cuisine, contains high fiber hay, no artificial color or chemical preservatives, no animal fat, or corn. Importantly, it has a balanced calcium-to-phosphorus ratio for a healthy urinary system. What we appreciate most about Cavy Cuisine is that it contains a stabilized form of Vitamin C with a 12-month shelf life) Also some Guinea Pigs do not like basil or mint, so try feeding her only a small bit first. They love oregano ,parsley and coriander. Do not give them too much to start with as a change in food can cause an upset stomach. Join in and write your own page! It's easy to do. How? Simply click here to return to Guinea pig FAQ.